8 rods - 8 casters: Test of 5 line rods. Measurements of casting distance and action - what's best? The stiffest rods will create the longest casts! This is a common assumption made by fly casters, but is it really accurate? What follows are the results of a test that examined this hypothesis by combining length measurements of distance casts with measurements of rod stiffness using the Common Cents System (CCS). The test utilized eight casters, all of whom cast eight rods. Each caster made four casts with each rod. The article originally appeared in the Norwegian magazine "Alt om Fiske" in October 2006. 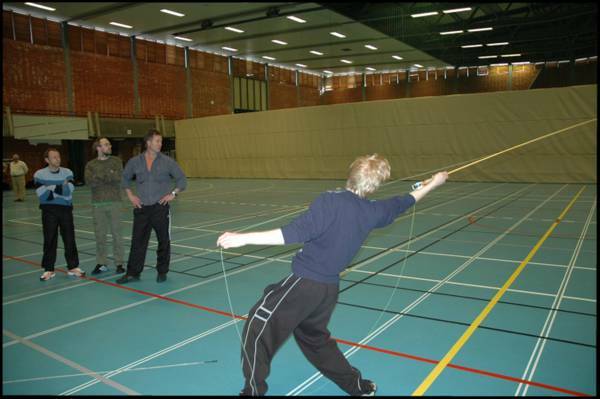 During the winter of 2006, the first competitions in a new tournament casting discipline-the "5-Line Cup"-were held in Norway. The Cup was inspired by the "Orvis-Morris Cup" that is held in the U.S. It proved an immediate success. The Cup competition was held indoors, and the casters competed in a combination of distance and precision casting. The equipment allowed was an "off-the-shelf" 9-foot fly-fishing rod, with a manufacturer's line-weight rating of no more than AFTM #5. Lines were limited only to AFTM #5 weights, with the Scientific Angler Mastery Expert Distance and XXD lines were the most popular. Selecting a new fly rod is, and will always be, a subjective choice. Unfortunately this is also the case in rod tests. Even if rod testers try to be as objective and unbiased as possible, you can't be certain that the rod the testers choose as the "dream" rod is the best choice for you. And even if most of us agreed upon some criteria for craftsmanship, quality of materials and smoothness of action, our casting judgment and rating would still be subjective in the end. Our view would depend on our casting style, casting ability and how and where we planned to use the rod (and even aesthetics). A rod that one caster might view as precise and well suited to distance work, might be seen by another angler as little more than a stiff poker. The same can be said for the "looks" of a rod. There have been plenty of published rod tests over the years. Some of them might give you a good overview of available rods on the market and what different testers think is a good value for the money. What we have done here is a completely different type of test! In this test we have looked more closely at a few selected rods rated by their manufacturers as "5-line rods," and we have carefully investigated certain aspects of each of the rods. The test method is such that we believe we can rate the distance casting abilities of the rods in an objective manner. The first seven rods in the test were chosen because experience proved they where good distance rods, and some of the rods had been used with success in the 5-Line Cup. Rod number eight-an 8-foot, 8-inch Loop Yellow Line-was picked in order to provide comparison to what was considered a "normal" fishing rod. The Yellow Line is considered a more moderate rod, and it was the only rod in the test that was shorter than 9 feet. Table 1: The rods in the test. 1- Vogg First is also available in 3 pc. version. 2- Orvis T3 Tip Flex 9,5 is also available en 4 pc. version. Norwegian rods: some of the rods in the test are of Norwegian design and are to our knowledge not distributed outside Norway. Vogg First is designed by Geir Grevstad, Streamstix T5 is designed by Sven Kalmar, and Knut and Trond Syrstad are the designers of the LTS X-1 rod. The T5 is from the new "competition range" rods from Streamstix, tailored for casting- or fishing-competitions. LTS X-1 and Streemstix T5 are new rods for 2006. A Scientific Anglers Mastery XXD WF5F floating fly line of 32 meters length was used in the test. The competition version of the XXD, which has the same belly length as the ordinary version and four meters more running line, has been the most popular of the four allowed lines in the 5-Line Cup. The XXD-line has a long belly-more than 20 meters-compared to "ordinary" WF lines with belly lengths that are typically slightly more than 10 meters. The mass of the XXD line also slightly concentrated towards the tip which delays and enhances turnover-a definitive advantage in distance casting. The XXD is in our opinion best suited for experienced anglers since you have to aerialize most of the long belly in order to get the most from shooting. As a fishing line, the XXD is best suited to situations where long casts are required and there is plenty room for the back cast. The line can also be put to good use for short-range presentations if shooting is not a primary concern. The XXD's front profile makes it among the best lines when it comes to turning over big flies into strong winds. In addition to the XXD line, a 9-foot knotless, tapered mono leader and a hook-less tournament casting fly (similar to those used in "casting sport" and in the 5-line cup) was used. After each set of four casts, the line was cleaned and polished with Armor All dashboard polish to ensure that the line was equally slick in all casts. Armor All has been used among tournament casters for years and its main advantage is the price. As discussed previously, each caster in the test made four casts with each of the eight rods. All of the casters were highly experienced (tournament casters at the top national level). One might argue that the caster group should have been more representative, with casters of all skill levels included. But, for the objective of this test, we felt it was an advantage to use good casters since they adapt quickly to different rods and make each rod perform at a high level. We felt that such a skilled group provided a fairer judgment of all the rods in the test. None of the casters were given the opportunity to practice with any of the rods before the test. If there had been more time available, it would probably have been best to allow all casters to familiarize themselves with the rods before the actual test. 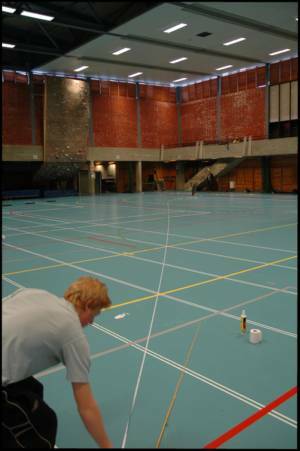 The test was performed indoors at the Norwegian Academy of Sports, which provided a windless, "condition-neutral" stage. This was absolutely crucial if we were to evaluate the rods based on casting distance. If the test had been performed outdoors, even small changes in the wind could have lead to many meters gained or lost in otherwise "equal" casts. As it turned out, the achieved distances with the different rods were so close that wind effects would have ruined the test. 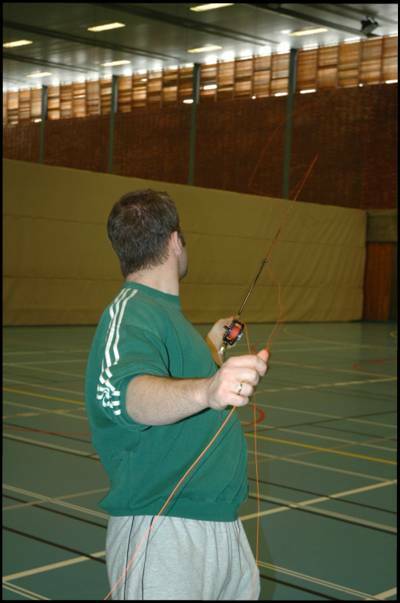 We also wanted to test more fly lines, but due to the limited time in the sports hall we prioritized by testing a larger number of rods. Eight rods and eight test casters with four casts for each rod gives a total of 256 measured casts in the test. The results are summarized in the table below. Table 2: Average casting distance (meters), standard deviation and longest recorded cast (meters) for the eight rods in the test. As you can see in the table above the difference between the rods are relatively small. There is slightly more than a meter's difference in average casting length between the "winner" and "loser" rods of the test. The "best" test caster cast, on average, 4.3 meters farther than the "worst" test caster. The overall average cast in this test was 29.4 meters. The average casting length does not tell everything about a rod's ability to help make long casts, especially not how consistently a caster can make a rod perform. Long average distance, combined with low standard distance deviation, indicates that a caster can easily adapt to a rod and get maximum performance quickly. High standard deviation indicates that a rod does not readily suit a broad range of casting styles or casting abilities, and good casting ability and/or a longer adaptation period might be key(s) to succeeding with the rod. When looking at the difference in average casting distance for different rods, the difference is statistically certain or statistically significant when it exceeds 0.61 meter. The Orvis T3, Sage TCR and G. Loomis Streamdance achieved almost equally long casts on average. Based on this, we conclude that the Orvis T3 is better for consistent distance than the Vogg First, Scott S3, Loop Yellowline, LTS X-1 and the Streamstix. Only one caster achieved his longest cast with the Orvis T3, but the rod produced the least distributed casting distances and the lowest standard deviation. Three of the casters achieved their longest cast with the Sage TCR, while two of the casters had their shortest cast with the same rod. This resulted in a high standard deviation for the TCR. One of the casters achieved his longest cast with the G. Loomis rod and many of the casters was able to throw far with the rod, resulting in a low recorded standard deviation for the rod. The longest cast in the test, which measured 36.44 meters, came from the LTS X-1 rod. One other caster also had his longest personal cast of the test with that particular rod. There was large variation in the results from the LTS, however, leading to a somewhat large standard deviation. The caster with the longest cast in the entire test also hit 36.35 meters with the Vogg First rod and 36.05 meters with the Sage TCR. Two of the casters achieved their longest cast with the Loop Yellow Line, but the longest cast with this rod was still 3 meters shorter than the longest cast in the test. The Streamstix had the shortest measured average distance. Despite that, one of the casters had his longest personal cast with that rod. The Loop rod was not significantly better than the LTS or the Streamstix if one looks at the average casting distance, but the LTS X-1 had a much larger standard deviation than the others. Standard deviation is a measure of the scatter of the data in a dataset. An example: If we imagine that we measure the casting distance for a series of casts with two different rods, and both rods give an average casting distance of 30 meters. But for the first rod the casts are evenly distributed between 29 and 31 meters, while the other rod produces casts evenly distributed between 15 and 45 meters. In this case the standard deviation will be much larger for the second rod than for the first rod. And even if the average casting distance for both rods are the same, the second rod will give a much higher probability for a really long or a really short cast than the first rod. A tournament caster would probably prefer the second rod, while most fishermen would probably prefer the first rod. Table 3: CCS-measurements for the test rods, showing stiffness and action angle. The Action Angle was not measured for all the rods since this measurement was not used for any further analyses. There were large differences between the test rods in terms of stiffness. The softest rod was the G. Loomis Streamdance with ERN = 5.2 while the stiffest rod was the Streamstix T5 with ERN = 9.0. In CCS terms a rod rated for AFTM 5 lines "should" have an ERN value around 5.5 (between 5 and 6). It's thus only the G. Loomis, Orvis T3 and the LTS X-1 that would be rated as "5-line rods" in CCS terms. The CCS rates the Loop Yellow Line, Vogg First and the Sage TCR as 6-liners, the Scott S3 as a 7, and the Streamstix T5 as a 8/9 WT rod. Illustration 1: Average casting distance for all the rods plotted against the measured stiffness. ERN=Effective Rod Number. Apparently huge differences, but it's not too surprising. 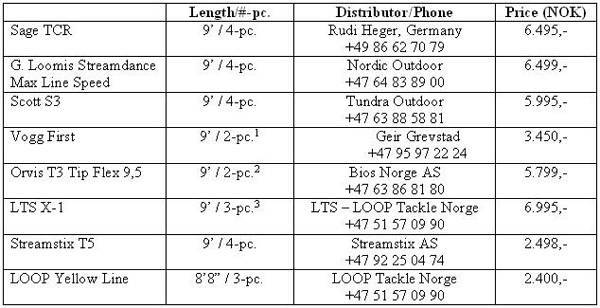 When the Swedish web site Edgeflyfishing (www.edgeflyfishing.com/) ran a test of 39 fly rods rated for AFTM 5 lines, the reported ERN-numbers ranged from 3.9 up to 8.1. One explanation on the high ERN numbers found in our test, could be that the manufacturers on purpose "underclass" their rods in order to market them as good distance rods. Another explanation is that "5-line" rods now have a much wider range of use than what was common when the AFTMA system was established. Today, 5-liners may be used for everything from close-range work for difficult trout in small creeks to long overhead casts for sea trout on the coast. It's obvious that a rod is much less loaded with 5 meters of a WF5F line outside the tip than with 15 to 20 meters of line outside the rod tip, and that a single rod could not be "perfect" in both fishing situations. The much wider range usage of a single line weight today is also apparent in all the available line profiles on the market. The most extreme versions of the WF5 taper we have found are the Guideline Presentation line (which has a belly length of just 6.5 meters) and the Scientific Anglers Expert Distance line (which has a total belly length of 20.8 meters). It's also important to note that the AFTM scale only defines the line class based on the mass of the first 30 feet (9.14 meters) of line. It is not a class standard for rods. Therefore, there is no such thing as an "AFTM class-5 rod," even if we use such a term all the time. The AFTM number printed on the rod does not follow any defined and standardized scale, it's just the rod designer's or manufacturer's line recommendation for the rod. Even if most of us agree with a designer's rating, there aren't any standardized scales that clearly define a "5-weight" rod. It might be unwise to leave behind a well-known system like the AFTM, but if one wanted to take the next logical step in rod/line matching, it would be to describe rod categories in grams or grains. Then the angler could decide for him or her-self how to best match the rod. For example, a rod might be matched with many meters of a DT3F or only a couple of meters of a WF7F (line selection depending on the actual fishing situation and fly size). For double-handed rods this is already accepted as a good solution and it has been implemented by several manufacturers. When fly fishermen meet, you'll often hear stories of easy dry fly casts up to 25 or 30 meters, and sometimes even longer. We believe that in most cases these stories are the result of wishful thinking, or perhaps the lack of a measuring tape. During last winter's 5-Line Cup, we watched many of the best casters in Norway compete in perfect conditions without wind, using the best equipment for distance casting. Despite that, the 30 meter mark was not passed with every cast. To make such a distance, up to your waist in a river, with a strong wind, aiming your back cast through a small opening between the trees, sounds rather unlikely. To put it straight: Twenty-five meters is an extremely long dry fly cast! Thirty meters is not impossible, but there are few casters (if any), who are capable of doing this on a regular basis with light trout tackle in most practical fishing situations. Generally speaking all the 8 rods in the test defended their reputation as good distance rods. All of them did have the backbone to handle a lot of line outside the rod tip (which is the foundation of distance casting with full lines), and all of the 8 rods delivered long casts. There was a considerable larger difference between the eight casters than between the average distance thrown with each of the eight rods. And when throwing long casts, the person holding the rod is far more important than the choice of rod (even if advertisements tell us the opposite). Five of the eight rods in the test delivered the longest cast for at least one of the casters. This demonstrates how important it is for you as a reader of this test, or as a reader of any rod test, to try the rods in question before you go out and make the purchase. Even if the most recognized fly fisherman in the world should recommend a rod, there is no guarantee that the rod will suit you the best. There are so many important factors when choosing the right rod, like casting technique, how you fish, what you think is pretty, brand preferences and prior experience. So giving a purely objective recommendation on such a subjective matter as rod choice is essentially impossible. That said, we would also like to point out that there are lots of good rods on the market, and most of us will be able to find any number of rods that suit our needs and desires. If pressed to declare a "winner" of this test, it would have to be the Orvis T3 Tip Flex 9.5. This rod achieved the longest average casting distance and the lowest standard deviation in the test, which indicates that it is a rod to which it is easy to adapt. The T3 is a sensitive rod, too, and it is comfortable to cast even at short ranges. This is a significant advantage if the rod's primary use is not the 5-Line Cup, but ordinary fishing. The T3 comes across as primarily a fishing tool, with the added advantage of being an excellent distance rod. The T3 is even a "true" 5-liner in CCS terms. The Sage TCR achieved the second longest average distance in the test, but also the highest recorded standard deviation, which demonstrates that a long-distance rod can be a challenge to handle. It's also apparent that Sage, with the TCR, has found a good recipe for distance rods, since the 10-foot version won a similar 7-weight test in "Alt om Fiske" last year. 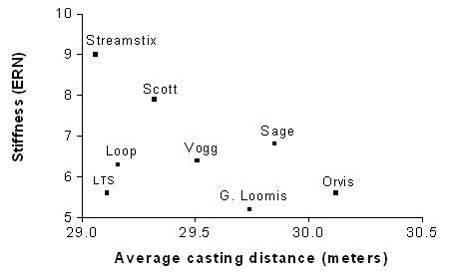 G. Loomis Streamdance Max Line Speed also achieved good results in terms of average casting distance. From the rod's name one might expect an ultrafast, stiff and demanding poker, but the test casters reported that this was not at all the case. The rod was forgiving and easy to get a feel for, and that was reflected in the low measured standard deviation. This was also the softest rod in the test, with a measured CCS ERN value of 5.2, which in CCS terms is on the soft side of 5-line rods. We were surprised by the fact that the Streamstix T5 ended up with the shortest average casting distance, since the T5 was "developed" as a specialty rod for distance casting with the XXD line. This rod has, however, thrown very long casts. 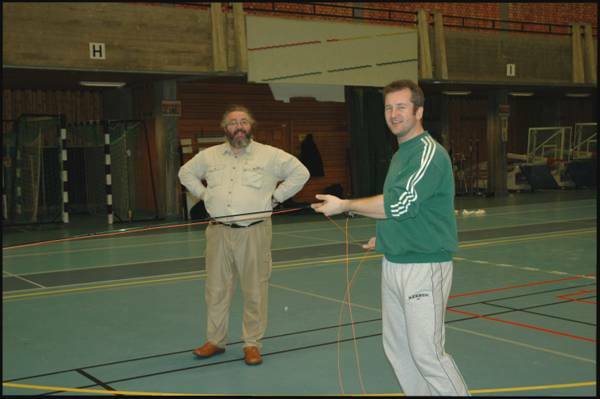 The rod got a lot of attention after the first round in the 5-Line Cup when Micael Blomberg achieved a cast of 34 meters-the longest cast of the round. The T5 also had the highest ERN value in the test. We should also mention the LOOP Yellow Line. This was the cheapest rod in the test, and it was included so we could have a "normal" rod in the mix for comparison to the hand-picked distance rods. The fact that it did as well as it did despite being 4 inches (10 cm) shorter than the other test rods is impressive. When we are talking about distance ability only, our experience is that longer rods have the advantage. 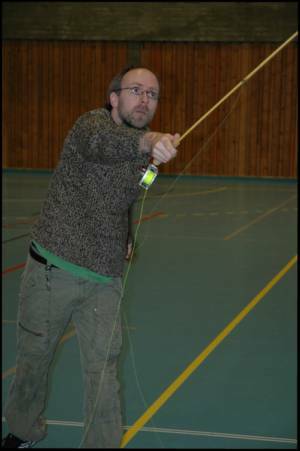 We often observe that we are able to cast 1-2 meters farther with a 10-foot rod than with a similar 9 foot rod. If we look at rod price, we can divide the rods into two different groups. The Vogg First, Streamstix T5 and the Loop Yellow Line retail at roughly half the price of the other test rods. The test shows no clear correlation between price and a rod's ability to deliver long casts. We would like to sum up the test with the comment made by Andreas Fismen after reading the results: "This test clearly demonstrates that if a fish is beyond reach, it's beyond reach whatever rod you are carrying!" - A special thanks goes to the Casting community in Kristiansand, Norway, who have participated in all phases of the test. Stein Grønberg, Rolf Magne Karlsen, Ronny Stavsholt, Rune Brenna, Martin Nøkleberg, Jan Vidar Josephson og Per Knutsen. - Grunde Løvoll, Andreas Fismen, Alf M. Sollund, Kim Millinge, Robin Olaussen, Olaf Christensen, Tom Syversen og Ken Tore Tallakstad.